I’ve been avoiding the blogging world for a few weeks because my heart is heavy. I think most people have heavy hearts these days. The world is a scary place, but the truth is that it’s always been a scary place. It dates back to the Garden of Eden when man fell and we were no longer given a perfect world to live in. Despite that fact, the truth remains that we are living in a time of uncertainty and unrest. There’s this park I visit often with my kids. They just built a new playground there because it was in much need of a makeover. Until our big move almost two years ago, we have never lived this close to so many great playgrounds. But we especially love this playground. Last week we were there with a few kid friends and mom friends. All of us are fans of this park. All of us visit it frequently. We were the only moms there at the time. I’ve found that is usually the case at this particular county park. But isn’t that the best, a well-kept secret? Except it’s not. All four of us had similar experiences at this park that have caused us to swear off visiting alone. All four of us had been followed by weird cars there. It could have been nothing, but with the world the way it is these days (and all days past) you never know. But isn’t this sad? Isn’t it unfortunate when I don’t want to take my kids to their favorite park alone because I’m afraid? Then I read John 14:27. It says: “Peace I leave with you; my peace I give you. I do not give to you as the world gives. 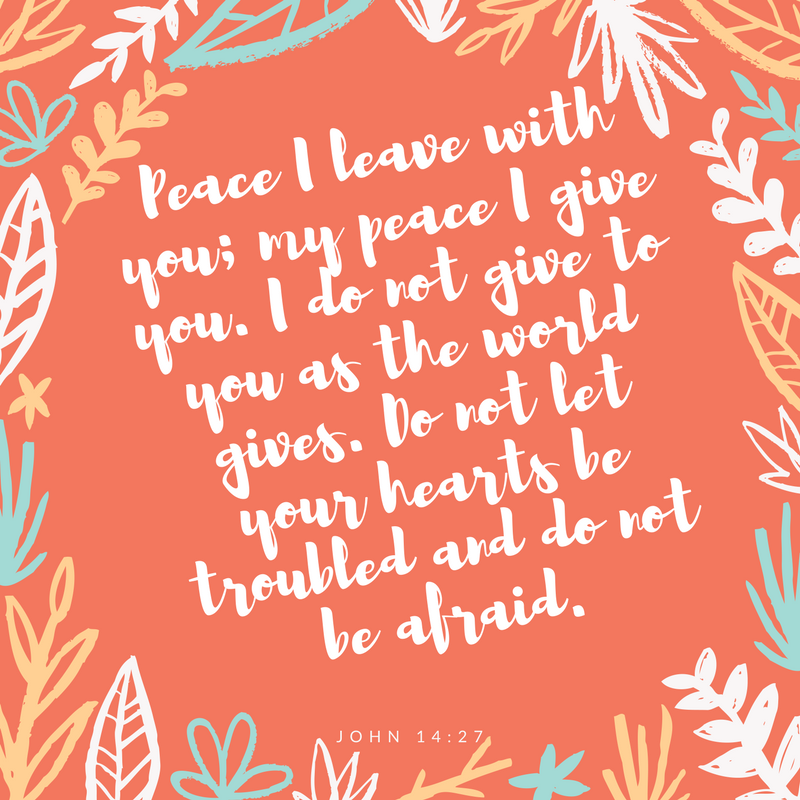 Do not let your hearts be troubled and do not be afraid.” We find a peace with God that the world does not provide us. This morning I went to the park without meeting with anyone. I was cautious, but I let my son play. Other moms showed up, and someone I kind of know happened to bring her kids to play. I was able to get to know her while we were there, and I would not have had that encounter had I been afraid. I would not have made a new friend today who has two kiddos around my son’s age. So though this world is scary, and I will be the first to admit that I can be overly cautious especially with my children, I refuse to live in this fear. I refuse to let my fear drive me until my children miss out. Also what is scarier than a toddler who doesn’t get out of the house? I don’t know about your kids, but my toddler can be a real horror when he is stuck bored at home. Having kids weighs on you, so we could all use less fear and more peace.